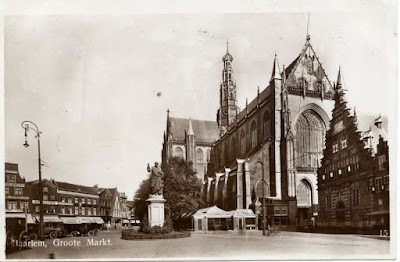 This postcard from Haarlem also featured in the Church Sunday series on my Roots blog. The card, sent in 1931, shows us the Grote Markt, the former market square, with the St. Bavo Church (famous for its organ). On the left is the statue of Laurens Janszoon Coster, who many Dutch consider to be the real inventor of the printing press, an invention generally ascribed to Gutenberg. If you compare the photo on the card with the current situation you will notice that not much has changed. Only the cars (extreme left) and the shop signs (behind the cars) look different now. Image attribution: Photo of the Grote Markt, from Wikipedia. Public domain, unknown photographer. 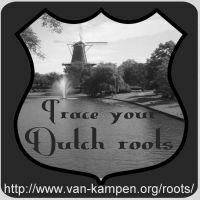 Newsletter will be sent out soon!